Recently, the Office of the President and the Undergraduate Student Government Association (SGA) have been collaborating to develop a plan to split the Spring 2013 commencement ceremony. “We suggest finding ways to increase the number of guests allowed per student. Given the current ticketing policy and the logistical challenges of changing the graduation, a split ceremony is the most feasible solution to increase the number of tickets available to students,” wrote Undergraduate Student Body President Eran Mordel and Executive Vice President Amit Khanduri, in a letter to Institute President G.P. “Bud” Peterson and Provost Rafael Bras. Peterson has informally agreed with proposals from SGA’s commencement committee to split commencement. This will ultimately allow undergraduates a chance to invite and include more people who have supported them throughout their academic careers to attend this once in a lifetime event. According to Peterson, this may afford each student approximately seven to eight tickets, compared to the four tickets students were previously guaranteed. However, an issue lies in the method of how to go about splitting the commencement ceremony. The primary option that is being looked at and researched is to split the ceremonies based on degrees awarded in each department. Other options which have been discussed include splitting by engineering and non-engineering, while another has been opening up a sign up to allow students to pick on a first come first serve basis which commencement time they would walk in. According to the Institutional Research and Planning website, the Fall 2012 semester totals for the number of degrees awarded in each department ranged from single to triple digits. The three departments with the most overall degrees awarded were the Scheller College of Business with 294 degrees awarded; the School of Mechanical Engineering in the College of Engineering with 250 degrees awarded; and the School of Electrical and Computer Engineering in the College of Engineering with 228. Another potential outcome of the split Spring 2013 commencement is when summer graduates will have a chance to walk at commencement. In light of the recent cancellation of summer commencement, summer graduates may be able to walk a semester early in the spring commencement before their last semester at Tech, instead of finishing school in the summer and returning in December to walk with the fall graduates. “It’s very likely that summer graduates will be able to walk a semester early, and that was a big win for us as well. It is a strong possibility, [but again], it can’t be promised because we don’t yet know what the actual numbers look like,” Khanduri said. 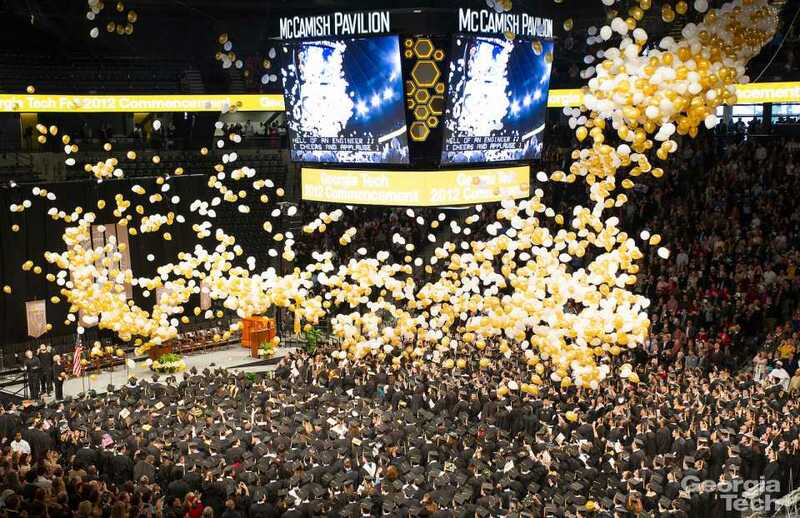 Although major plans cannot be yet be confirmed, the informal agreement to split commencement ceremonies is a step toward major changes in the future for graduating classes.